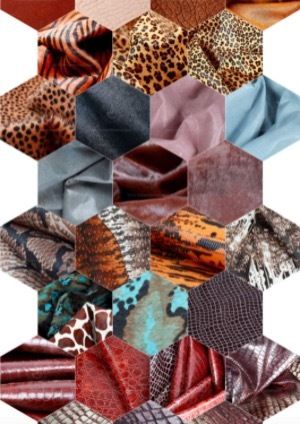 Patterns and prints can be applied to decorate leather. This can be done via embossing. Embossing and debossing are the processes of creating either raised or recessed relief images and designs on leather or other materials. An embossed pattern is raised against the background, while a debossed pattern is sunken into the surface of the material. 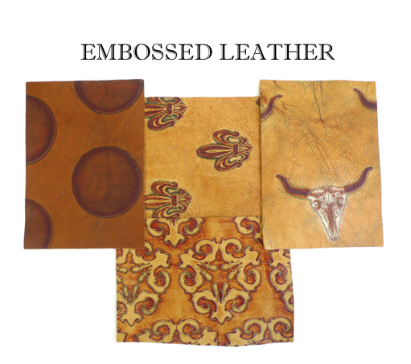 Embossing alters the surface of leather by providing a three-dimensional or raised effect on selected areas.​ To achieve this, metal dies with engraved pattern are used for embossing press. A specific level of pressure is applied to the dies in order to squeeze the fibers of the leather, which results in a permanently raised area on the leather. Embossing involves a separate stage in the production process of leather. It requires a separate press run. In addition to being used as a design element, embossing can be used to hide natural leather small imperfections.